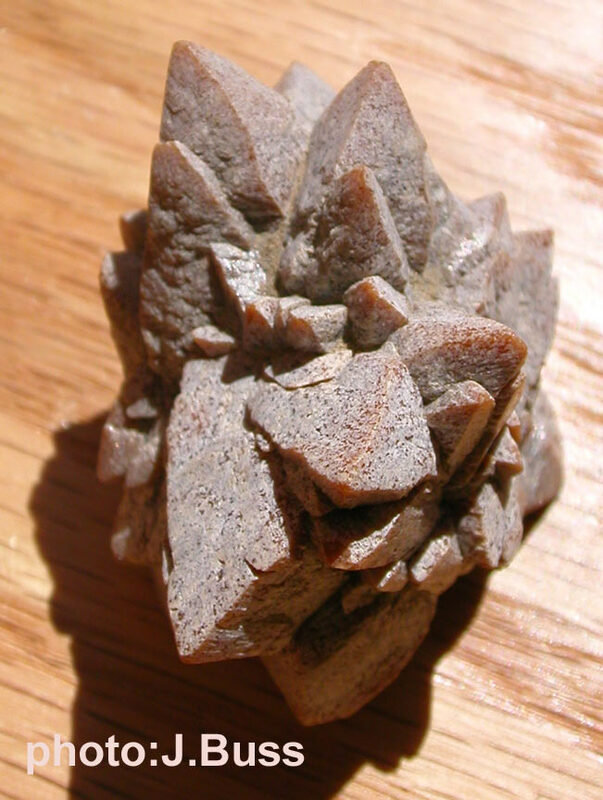 Glendonite is a Calcium Carbonate (think clamshell) that preserves the shape of Crystals of spiky superhydrated unstable Ikaite that forms in near-freezing water at the bottom of fjords, but disintegrates at lower pressure. 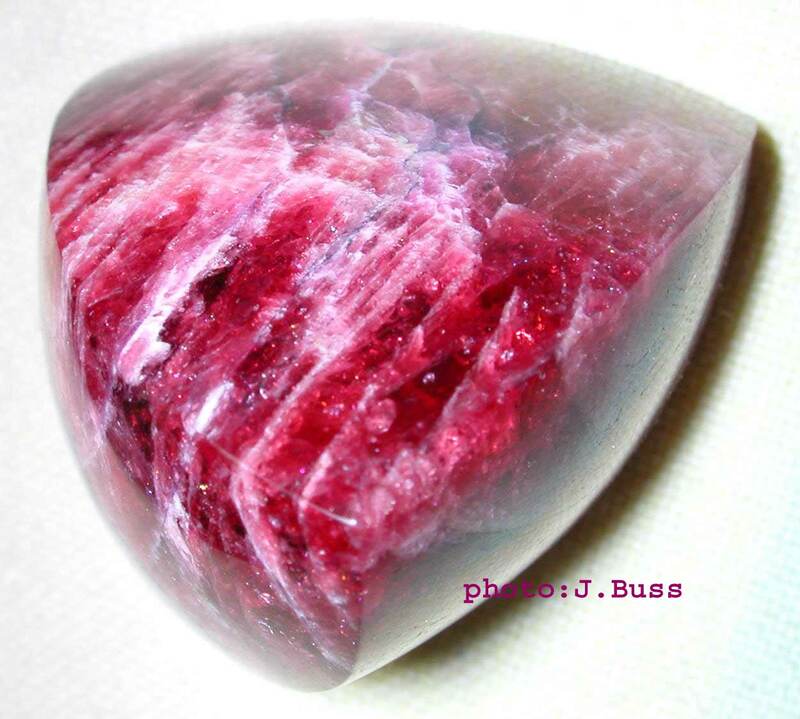 Ikaite is a hybrid of Ice and Stone. It’s an apt symbol for Rebirth into new Forms and Patterns after a period of exile. The exposure of loooong-standing Patterns as self-sabotaging, and the opportunity to shift them, with potentially Life-Changing consequences – but only if they’re addressed with reverence and compassion! The same theme is strongly reinforced by the Juno-Pluto Opposition that’s exact on August 29. The current 4-year Juno-Pluto Cycle is about the Choice between self-sabotage and self-support. Pluto Initiated Juno on January 14, 2013 in 10 of Capricorn, “An Albatross feeding from the hand of a sailor.” The Albatross is a symbol of good luck unless you kill it, in which case it becomes a curse. How similar to the Sedna myth! 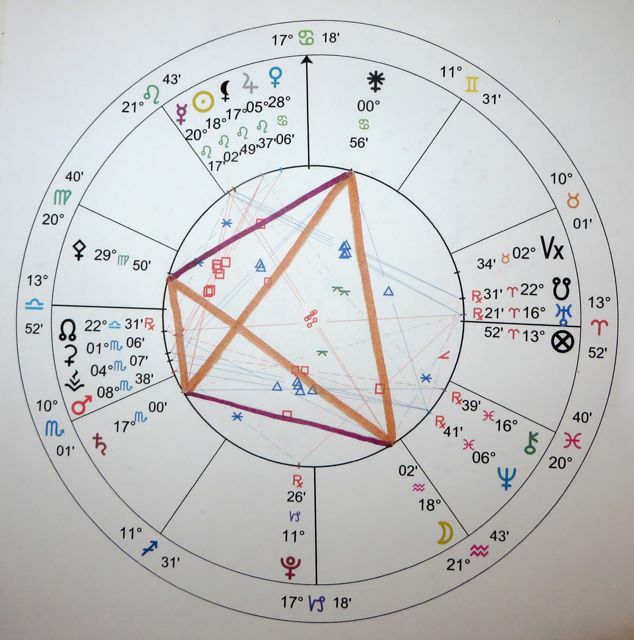 And reinforced yet again by Haumea‘s September 17 Initiation of the North Node, birthing entirely new and unexpected Patterns that will serve us well. And reinforced yet further by Eris on the South Node. Haumea is Pele’s daughter and the Hawaiian Goddess of Fertility. Her Initiation of the North Node occurs at 21 Libra, “A Sunday crowd enjoying the beach,” which Rudhyar reads as a society renewing itself through contact with Nature and itself. Because of the Herculean time scale involved and still-uncertain orbits, it’s hard to be sure about the Eris-Haumea Initiation, but 29 Taurus (in 1598) is a possibility: “The first Mockingbird of spring,” which again reinforces the possibility of Life-Changing shifts. 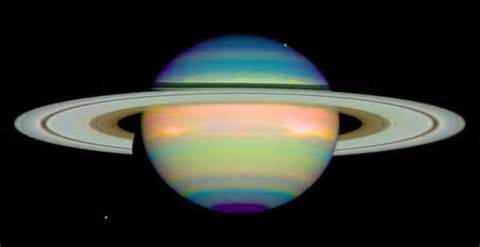 Back to August 25, Saturn Initiates Mars about five hours after the New Moon. This 2-year Cycle is about how efficiently we Focus the use of our Energy. We all have limited Energy – physical, emotional, intellectual, Spiritual. How often do we use it for The Most Important Thing? The Initiation occurs at 18 Scorpio, “A path through Woods brilliant with multicolored splendor.” Which is glorious, but there is a hint there of Autumn, as if The Most Important Thing might be for us to enjoy the splendor while beginning to prepare for winter. Dry some of those ‘Shrooms, or put up a few jars of Soup. 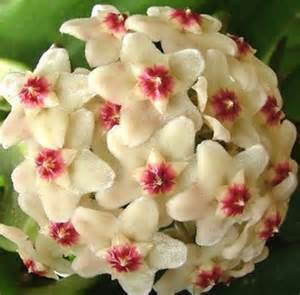 Maybe next Lifetime I’ll be a Hoya grower – another gloriously-aromatic night-bloomer. The same folks have a tidy addition for a solar air heater that might even be a useful supplement to a rocket mass heater. Well, I don’t seem to be able to get these placed and sized the way I would like, as WordPress keeps “improving” their software. So be it. I much prefer writing to debugging software, and I think that’s what you’d rather have me do as well (or why bother! ), so I’ll just have to ask you to tolerate imperfection here. Above are “Picture 1: Brilliant” and “Picture 2: Trine Fez” from the Grace and Discouragement post. You can already see the dark clouds of Discouragement threatening to overwhelm Picture 2. 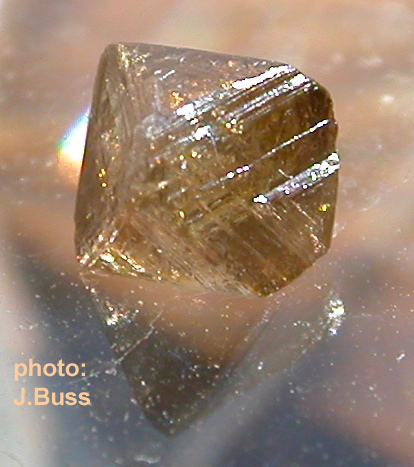 Diamond, symbol of One-Pointed Consciousness. This one’s Brown, which reminds us of mud, but which is really a shade of Orange, Second Chakra – Emotion, Desire. Are we clear about our Desires, or muddy? Our Desires are a Mirror for our Sacred Mission on the Planet. The cleaner the Mirror, the clearer are our Intentions and Actions, and more Ecstatic our Life. It’s more difficult to Follow Our Joy when the path is muddy. three very different arenas. Misalignment between these three often limit our ability or willingness to Manifest the Life we strive to live. One caution – don’t let the Grace that’s available here “go to your head,” or get stuck in your Ego. These are gifts from the Universe, they arise on their own, not because you Created them. Use them to Create what you Want, use them to Feel Good about yourself and your place in the Universe, but don’t use them to elevate yourself above anyone else or anything else. Humility is your best friend here. 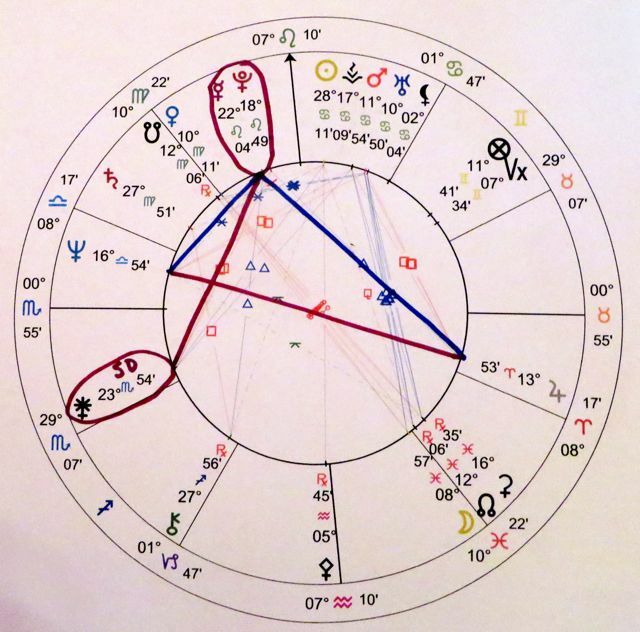 To review, Juno forms a Grand Trine with Neptune and Vesta-Ceres during these ten days. Do you actually Believe that what you Want is possible? Tap out any doubts that arise, and PIAVA to Believe in the possibility. Do you actually feel like you Deserve what you Want? Tap out any doubts that arise, and PIAVA to Deserve what you Want. Do you actually Know what it Feels Like to have or be what you Want? Spend time with how you would Feel if you received what you Want. If you have any difficulty with that, use Tapping and PIAVA to refine what you Want. Let it shift if it wants to. Try It On. Go about your Life for a while as if you had already received what you Want. These work especially well with Theta Healing. August 15 between 3pm and 9pm PDT should be an excellent time for Manifesting. The Moon Opposes Vesta, forming a Kite. From 6am PDT August 17 till 9am PDT August 20, keep a close watch on your Thoughts. Thoughts are powerful. Negative Thoughts and Doubt produce a vibration that fills your Aura with Resistance to what you’re trying to do. Be particularly watchful for Self-Doubt, and Tap it out when it arises. Be mindful that Confusion is the first stage of Growth, and Let It Be, don’t try to “fix” it. This is a fantastic time to learn to separate your Thoughts from their Content. Thought is one thing, What you’re Thinking about is quite another. Don’t pollute one with the other!! This Energy intensifies between 3am PDT August 18 and 3pm August 19. It intensifies yet again from 8pm till 9pm PDT August 18. If you possibly can, spend from 9am till noon PDT August 20 in Meditation. The rewards will be profound, especially if you’ve succeeded to any extent in separating the Universe from your Thoughts about it. From noon till 7pm PDT August 20, Expand everything you Do, Feel, Think, Want, Are, and Have. Watch for Shadows of Doubt, and Tap them out. Mercury Opposes Neptune to head up a Kite from August 17 till August 20, and on August 20 the Moon Conjoins Juno. August 25 would be another fantastic day to deepen your relationship to the Great Beyond, especially between 3pm and 9pm PDT. The Moon makes another Kite, Opposing Neptune this time. We could advance our Mission on the Planet by leaps and bounds by Paying Attention to these Portals. 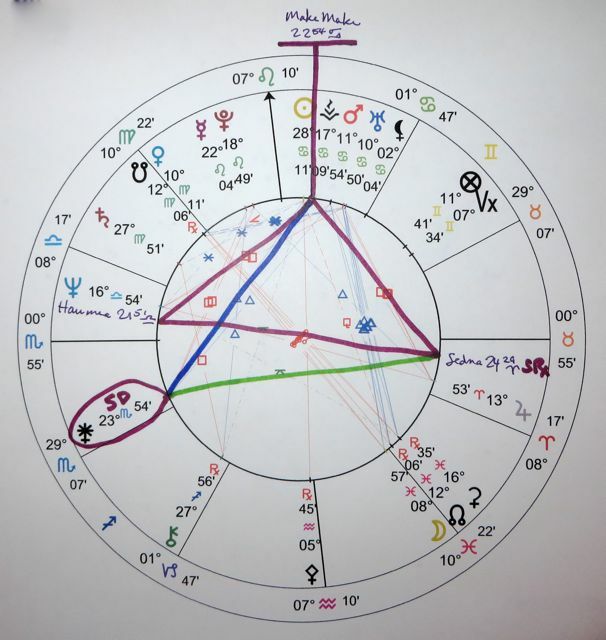 The Grand Trine, three planets equally spaced around the Zodiac, is the grandaddy of Good Luck, but its Energy can be diffuse, and can easily devolve to arrogance if one does not recognize it as Grace. When a fourth planet forms a Kite by Opposing one of the three, the Energy becomes Focused through the fourth planet – Power and Magic Are Afoot. 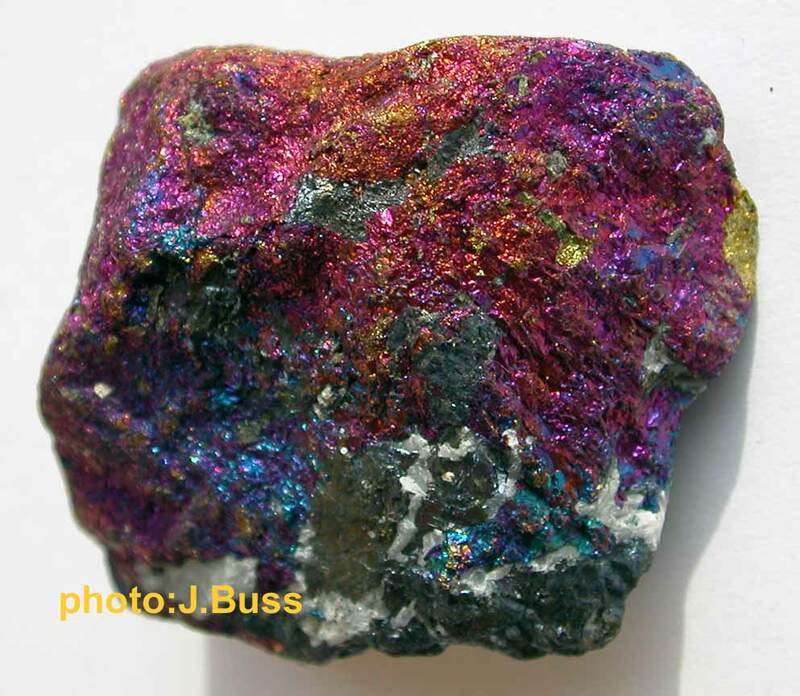 “Peacock Ore,” a Copper ore somewhere between Chalcopyrite and Bornite, a riot of color that changes as the angle of the light and the angle of the eye change in their perspectives. We’re due to receive Blessings from the Universe for most of the rest of August, and into September. From around August 15 till about August 25, we can expect Grace around the Alignment between our understanding of the Sacred and our actual relationship to that which is larger than ourselves (including Culture, Planet, Godhead). These are two quite different things. For instance, suppose we believe that it’s more important to be quiet and nice than it is to be loud and honest, but our Culture habitually exploits us (http://billmoyers.com/2014/08/12/theres-another-mammoth-global-trade-agreement-you%E2%80%99ve-never-heard-of/, for instance) – then some Realignment would be very useful, if troublesome. 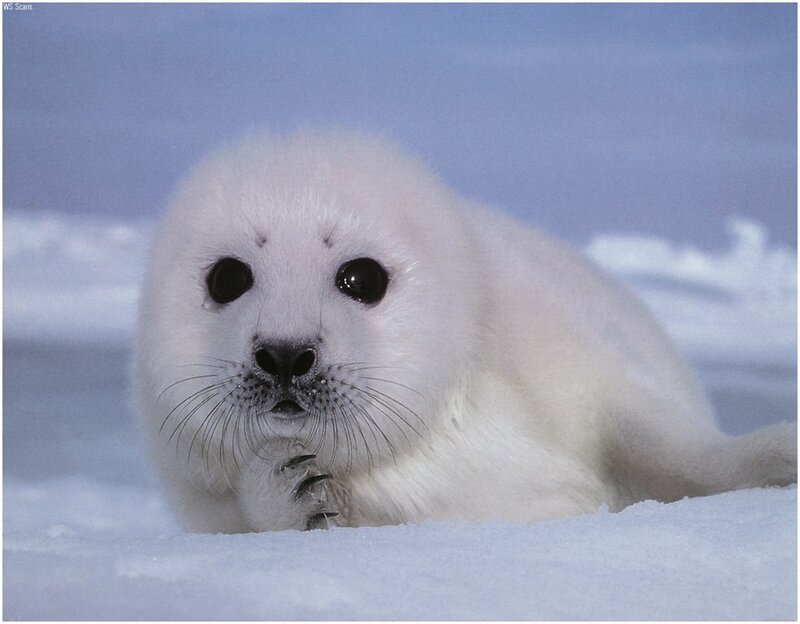 Since this is Grace, the trouble could be reduced. Similarly, if we were Programmed to believe in a Punishing God, but our preferred experience with the Godhead is one of Grace, we could find that some of our Programming comes up for review. Since much of our Programming is below the threshold of Consciousness, this may involve more than just “thinking it over.” We could also encounter Attitude Adjustments about things like Global Warming (http://billmoyers.com/2014/08/08/do-these-bubbles-signal-the-start-of-rapid-climate-change/), World Peace, or the importance of our own Mission relative to the Planet as a whole. During most of this period, our understanding of what’s Sustainable, and of what we need to Sustain ourselves, will be shifting as well. Basically, the most important outcome will likely be an improvement in out ability and willingness to “give it over” to a higher power, not as a “giving up,” but as a request for clarity and assistance. Like Paul Gautschi says, “That’s too big for me, I’ll have to Ask God” or Goddess or your preferred image of the Source of All That Is. It’s my intention to go through the month and make a list of dates and times when the Moon will greatly enhance the Blessings, and get that out to you soon. 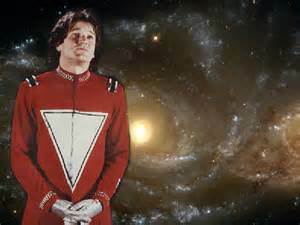 “I am so sad about Robin Williams. So fitting that the role that made him famous was that of an alien. He always reminded me of Home (not here). Which is actually very perceptive. 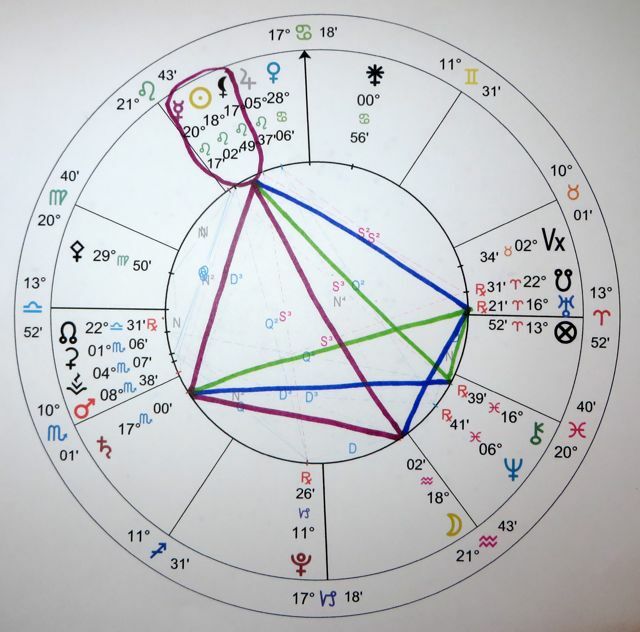 A quick look at his chart shows how. In any other Culture he would have been seated next to the Chief or Emperor as a renowned Heyoka Shaman. What’s the equivalent in Western European Culture and its descendants? The Jester – The Fool. But there’s a huge difference in prestige between a Heyoka Shaman and a Fool. And Robin had the Courage to visit a Culture where he would be a Fool instead of a Heyoka Shaman. The loudest influence in his birth chart is an unlikely combination of the Profoundly Profane, Yintegrity, and the Sacred, all devoted to serving Spirit. Parallel to Sunday’s Full Moon, his Mission involved Emotional Stability, Manifestation, and Permanence. He would resolve the apparent Conflict between the Profane and the Sacred by Wondering about how he might approach his Mission. His Karma involved Feeling everything Deeply – Life on this Planet would have given him great Pain. He would resolve his Karma-Mission Conflict by vigorously Acting Out his Yintegrity in a Sacred Manner. His Anger was born out of Compassion. Without a Culturally acceptable venue for Acting Out Sacred Anger Compassionately, it would have been directed inward. 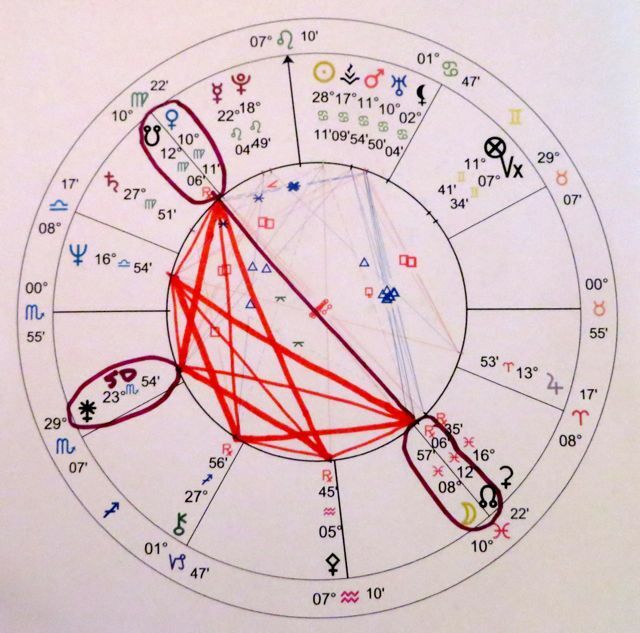 Mars was Out of Bounds closely Conjunct to Uranus, and more loosely Conjunct to Vesta, near the top of his chart, at the point of a T-Square, with Jupiter and Neptune as the base. His North Node was Conjoined by the Moon and Ceres. The focus of his T-Square was the Square-Trine corner of a Tricolor: Vesta-Mars-Uranus Square Neptune Quincunx NN-Moon-Ceres Trine Vesta-Mars-Uranus. Venus Conjoined his South Node. Vesta-Mars-Uranus formed a Trine-Sextile Bridge across his Nodal Axis. The folks at WordPress keep “improving” their editor, so now I can’t put pictures into the text. We may have to switch to a new blog. For now, I put the pictures into a separate post, “Heyoka Shaman Pictures” – See Picture 1 there. But behind this loudest influence is a Shadow. He had a closet Mission to bring deeply repressed material into Consciousness. See Picture 2. He had a Makemake T-Square with Haumea and Sedna as the base. The Makemake-Sedna Square was the root of a Tricolor with a Stationary Juno. His Life Work is a template for surviving the 21st Century. In this Lifetime he was Learning and Teaching about the Edges of Consciousness, by Setting Boundaries against Empathic Pain. He was Learning and Teaching about Depression and Miracles by Stabilizing Emotion and relating directly to Spirit. These two Lessons are very tightly interwoven. See Picture 3. 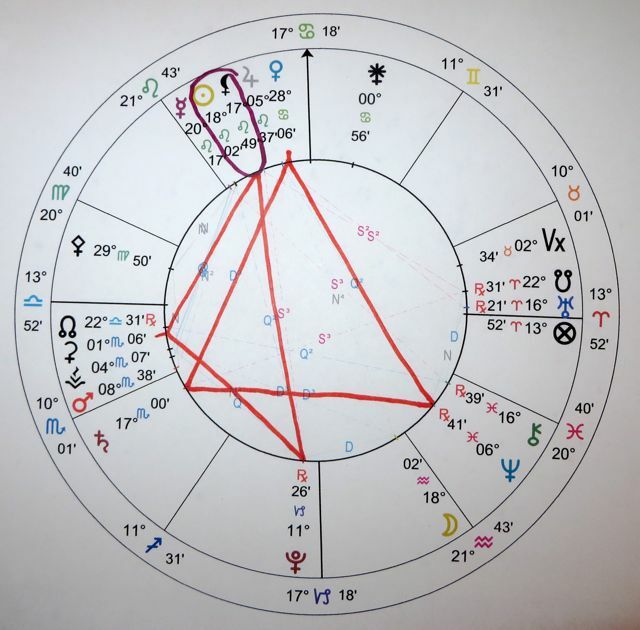 His Juno Quintangle had a base of Pallas and South Node-Venus – he was Learning and Teaching how to create Boundaries between himself and his Empathy with Pain. 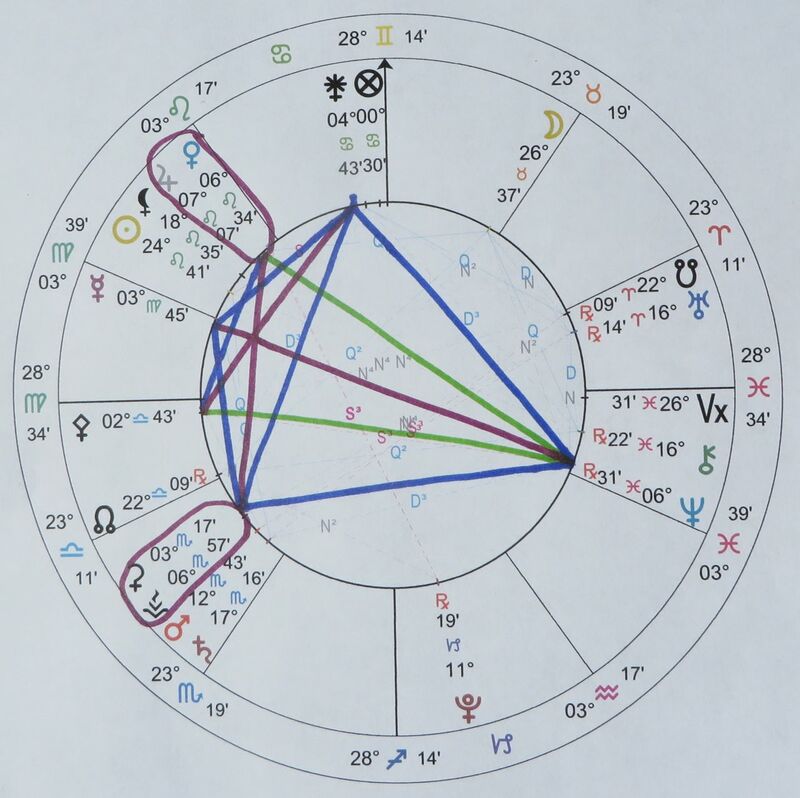 His Chiron Quintangle was on a base of Neptune and Moon-North Node – he was Learning and Teaching how to Stabilize his Emotions and relate directly to Spirit as the means to convert Depression to Miracle. Juno and Moon-North Node in these Quintangles are the third rails of the Tricolors under his two T-Squares. See Picture 4. Look what happens when we add the Deciles! A Tenth-Harmonic Decile is half of a Quintile. This is a very well-braced Quintile-Tridecile Bridge across his Nodal Axis. His Spontaneity was Compulsive, and through it he brought people in touch with the Edges of their Consciousness, and expanded their connection to Spirit. 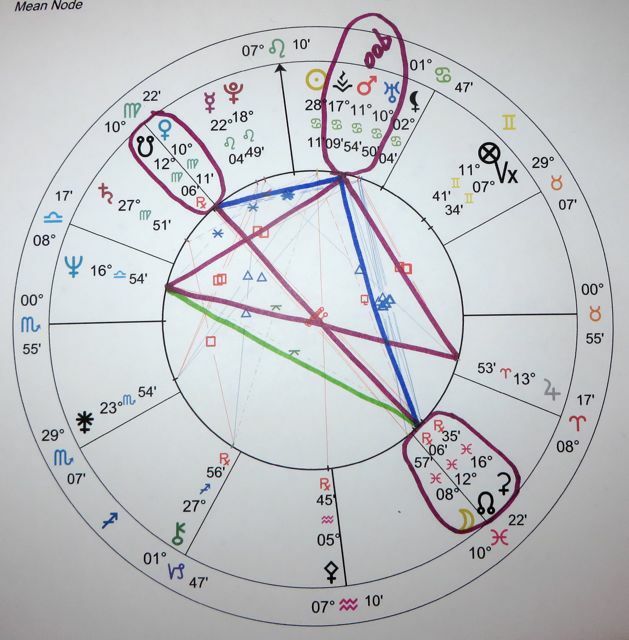 See Picture 5: His Mercury-Pluto Conjunction Squared his Stationary Juno, and Mercury-Pluto formed a Trine-Sextile Bridge across his Jupiter-Neptune Opposition. He died with Chiron dancing on his Juno, and Sun-Lilith on his Mercury-Pluto. What’s The Most Important Thing for our Yindependence? What’s The Most Important Thing for our Emotional Stability? Emotional Stability is paramount if we want to be able to Focus on any sort of Manifestation, whether it’s Healing, Abundance, World Peace, or a fun weekend. If we don’t have Emotional Stability we’ll Manifest a picture of what we’re actually Feeling – Fear, Anger, Grief. Even if we’re Feeling Joy but not Stability, we’ll manifest a picture of transient Joy. The Full Moon is Square to Saturn. The two questions are represented by the Square to Sun-Lilith and the Square to the Moon. Since the Sun Conjoins Lilith, our Yindependence is likely to be near the top of our priorities. The “answer” to both is our Yintegrity, but it’s not like we just need to go out and splash our True Self onto the World. Mystery is present; we need to Wonder how being True to our Deeper Self will respond to those questions, then step aside to see what happens. Uranus makes a Trine-Sextile Bridge across the Full Moon Opposition; however, it’s on the other side of the Opposition from Saturn, hence the Saturn-Uranus relationship is a Quincunx – Curiosity or Wonder. So the Sun/Lilith-Saturn Square makes a Major Tricolor with Uranus, and the Moon-Saturn Square makes a Minor Tricolor with Uranus. With a Minor Tricolor, since the Grace arrives in the form of a Sextile, we’ll need to Act to start the good flowing. In the case of our Emotional Stability, we’ll also need to take a step in the direction of Healing. In addition to Wondering about how our Truth will Heal jittery or negative Emotions, we need to PIAVA the Freedom to set our Masks aside, or tell someone what we’ve been afraid to say. There is a second answer to the Yindependence question, and it’s about Allowing Miracles. Which means that we need to work on our Beliefs, especially our Unconscious Beliefs. 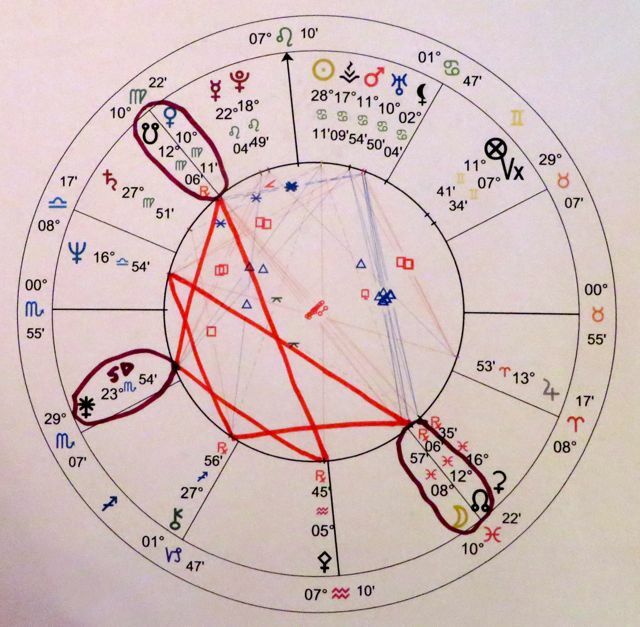 Chiron is Quincunxed by Sun-Lilith from the other end of its Saturn Square, making another Major Tricolor. “This is too big for me,” he says, “so I have to ask God.” Or Goddess, or Great Spirit, or your Guides, or your beloved Grandmother on the Other Side. That is, PIAVA it. Except in flashes of Insight, we don’t have access to our Unconscious Beliefs, they’re the fellow behind the curtain pulling the levers. So we need to PIAVA to be advised about any Unconscious Beliefs that inhibit our Yindependence so we can then PIAVA to get them changed – Lovingly and Gently – so we can proceed to Healing. Whenever you work directly with the Unconscious, always add “Lovingly and Gently” to your PIAVAs. Otherwise it’s too easy to “get what we asked for” – with unintended consequences. What’s the difference between Yintegrity (Uranus) and Yindependence (Lilith)? Yintegrity is about Creating the space where we can choose to exercise our Want-Tos instead of our Shoulds. Yindependence is about pursuing our own Goals and Values rather than giving our Power to someone else. They’re obviously very intertwined. Yintegrity is alignment with our Soul. Most of us “hired” (on the Soul level) the significant adults in our childhood to Program us to Believe, Think, Act – and even Feel – contrary to our Yintegrity. The potatoes of a Lifetime – the meat is our Mission – is detecting and overcoming our Programming. In many cases our Programming is a mirror image of our Karma. In many cases pursuing our Mission requires overcoming our Programming. Yindependence is alignment with our Inner Female. Yes, by and large, women are more likely to be in touch with their Feelings and therefore more likely to be in touch with their Values. But you can’t take that for granted. For instance, you may believe that it’s important to be nice to people. PIAVA to discover whether that’s a Value or a Should. There is a portion of our True Self which remains under wraps because we don’t believe it’s Possible to let it out of its cage. We were probably pretty bummed by the censorship once, but then we just got used to the notion that we couldn’t do anything about it, and just put the whole issue out of our mind. We’ve been repressing that bummer for so long that it’s just no longer part of our Reality. It’s become part of our Mythology instead. That’s just the way it is. How do we detect our Unconscious Beliefs about what isn’t Possible? Start with your Deepest Desire. Why is it that you don’t dedicate every waking Act to it? What would it Feel like if you could do that? What would it take for you to devote just one Act per day to your Deepest Desire, starting with the safest Edge of it? What would happen if you spent six minutes twice a day where you did nothing else except imaging how you’d Feel if you were Free to devote every waking Act to your Deepest Desire? I imagine that several things might happen. You might start to Forgive yourself for having a forbidden Desire. You might start being more relaxed about things and more able to “be yourself” in general. Your Desire may shift. When our Desires present themselves to us, they do it in code. Our Mission on the Planet is really far larger than we can ever hope to understand with the linear dualistic mind. So the carrot or chocolate bar or wine bottle on the end of that stick that extends out from our forehead is painted in colors that make sense to us from where we’re at. When we get closer to it, it repaints itself. We never know what it will morph into. The Full Moon also contains a whole new animal – what we’ll call an Octile Fez. It’s a Square Fez (Squares on the non-parallel sides), but instead of a Trine at the base and a Sextile for a cap, it has a Trioctile (Sesquisquare) for a base, and an Octile (Semi-Square) at the top. It’s two interlocking Mjolnirs that provide Epiphanies to unlock each of the Squares. The Moon-Saturn Square is the base of a Juno Mjolnir – Insight about Stabilizing ourself Emotionally comes to us from the Growing Edge of our Consciousness. What the heck might that mean? Let me review – what are The Most Important Things I’ve been Learning over the last several months? Okay, there’s this. And oh yeah, that. Good. And what is it I’m anxious about right now? Hmm, I can see how the first two are related – whenever anxiety arises I can just remember the larger context of what I’m Learning. But I do Wonder about how the second one relates. If I try to grow my Yindependence, they’re going to be upset with me. I Wonder how I can set a clean Boundary that doesn’t make things worse. You know, I may not need to be quite so reserved with those other people – they seem to like me and may be more accepting than I’ve been giving them credit for. I should test that gently, to see how they respond. So, can we summarize this Fez like we did the other one? The base is a Trioctile between the Moon and Juno, implying that we can enhance our well-being by Adjusting how we Manifest. What sort of Adjustment? The cap is an Octile between Pallas and Saturn – it’s Important that we Realign our Boundaries and Reassess who we Trust. It’s a Waning Octile, meaning we want to err on the side of Surrender more than Action. Maybe I should just be more honest and direct with people, rather than trying to control how they react to me – then see where the chips fall. I’d find out more about whom I can Trust that way, instead of trying to please everybody. I think I’ll try that. One thing we’re Learning here is how to Walk in Beauty with Spirit. We’re also Learning how important it is, and how to, make our Yindependence Sustainable. To find Healing, our historical and Karmic Traumas – our lost Soul Fragments – need to be reunited with the rest of us, and to do that we need to Love them, in the process Forgiving ourself and Other. Watch for evidence of this Pattern in your Life, and on the Planet, between now and August 26. 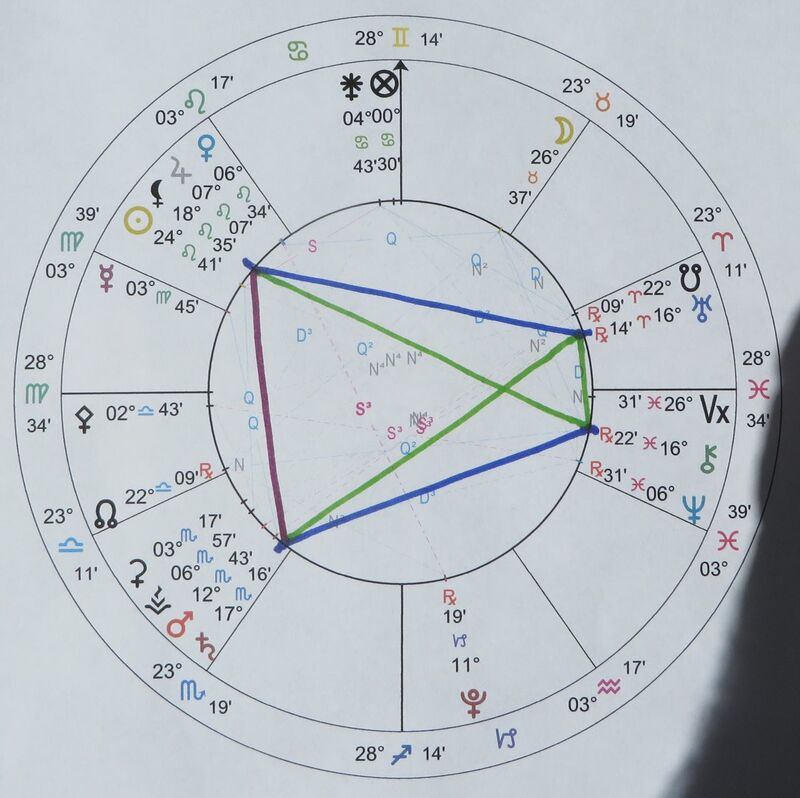 Sedna is not a portent of Evil, but a Pattern-Breaker – that is, Liberation from a Life-long “curse” is available here, and there are very Powerful helpers about to assist. The Saturn-Chiron Trine was Exact on August 5, but remains within one degree of Sensitivity till August 18 (when another very different but very Powerful Energy for Karmic Liberation moves in) and within three degrees till September 6. The Saturn-Chiron Trine has been with us since late 2012 (another “coincidence”); this is its fifth iteration, the final Confidence-Builder.